We, in the International League of Peoples’ Struggle, express our most heartfelt condolences to the Castro family, the Cuban people, the Communist Party of Cuba and government of Cuba over the passing away of Comrade Fidel Castro, the great revolutionary leader of the Cuban people and founder of the Communist Party of Cuba. We pay the highest tribute to him for leading the revolutionary struggles of his people and achieving great victories in upholding national sovereignty and independence, advancing the cause of socialism, contributing to the worldwide struggles for national and social liberation and inspiring the people of the world to persevere in the struggle for socialism and communism against US imperialism and all reaction. The greatness of the Cuban revolution under the leadership of Fidel Castro is immediately recognized by considering the fact that Cuba is a small country that is only 90 miles away from the US and yet the Cuban people have succeeded in liberating themselves from this imperialist monster, in defeating its aggressive actions such as that in the Bay of Pigs, countering the threat of nuclear attack, frustrating countless acts of sabotage and the hundreds of assassination attempts on Fidel Castro and prevailing over the most sustained embargo ever waged by US imperialism against any country. The Cuban revolution has been victorious because of the correspondence of Fidel Castro’s indomitable revolutionary spirit, mastery of strategy and tactics, daring and perseverance to the needs and demands of the Cuban people and their determination to fight and win when aroused, organized and mobilized. As a university student of law from a landed family, Fidel Castro sided with the oppressed and exploited people, opposed the brutal and corrupt dictatorship of Batista and founded an underground revolutionary socialist group called The Movement. The Movement launched an attack on the Moncada barracks on July 26, 1953. It failed as a military operation but it succeeded in sparking the spirit of resistance among the youth and people. 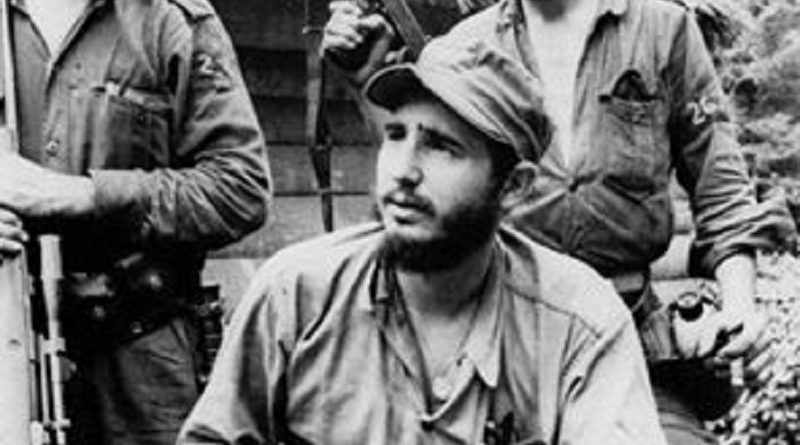 Fidel Castro together with many other participants in the Moncada attack were arrested. Imprisonment gave him the chance to read revolutionary works, including those of Marx, Lenin and Marti. His speech in court, “History Will Absolve Me”, became a powerful piece of propaganda. Castro was released from prison in 1955 and left Cuba for Mexico. He regrouped The Movement and eventually renamed it as the July 26 Movement in honor of the Moncada attack. With his Argentine comrade Ernesto “Che” Guevara and others, he set sail for Cuba on the Granma in order to wage guerrilla warfare against the Batista regime. Under his strategic direction, the few guerrillas grew from small to big, from weak to strong, by destroying the 5000-troop backbone of the Batista army piece by piece at the Sierra Maestra. In coordination with the revolutionary mass movement in the urban areas, the July 26 Movement won total victory on January 1, 1959. Fidel Castro proclaimed victory and proceeded to transform Cuba by ending Batista’s rule of terror, carrying out land reform and wealth redistribution, eliminating illiteracy and expanding education, realizing universal health care of high quality and providing other social services. He nationalized US-owned companies, refineries and land and thus earned the wrath of the almighty USA. The US Central Intelligence Agency launched the Bay of Pigs invasion of 1961. This was thoroughly defeated and the revolutionary prestige of Castro and the Cuban revolution resounded throughout the world. Next came the 1962 Missile Crisis which exposed the vulnerabilities of the US to Soviet nuclear power on various geographic scales during the Cold War. It is estimated that Castro himself became the target of at least 638 assassination attempts and Cuba to countless destabilization attempts, aside from the relentless economic, trade and financial embargo. Under the leadership of Fidel Castro, the revolutionary proletariat and people of Cuba have stood out as the most formidable revolutionary force inspiring the people of Latin America to fight for national independence, democracy and socialism against US imperialism. They have not wavered in taking the road of anti-imperialist resistance even during the “special period” when drastic adjustments had to be made in the face of the disintegration of revisionist regimes in Eastern Europe and the Soviet Union no less. Up to recent times, they have cooperated with Venezuela and other Latin American countries in building the ALBA (Bolivarian Alternative for the Americas) in accordance with the principles of social welfare and mutual economic aid and in opposition to imperialist and reactionary policies, especially neoliberalism, subversion and military intervention. They are known for outstanding policies and acts of internationalism not only in Latin America but also on a far wider scale. They have played a major role in the tricontinental movement of anti-imperialist governments and peoples earlier inspired by the Bandung Conference and then by the Non-Aligned Movement. Under the direction of Fidel Castro, Cuba played a major role in fighting the forces of imperialism, colonialism and neocolonialism. As an outstanding example, Cuban troops frustrated the armed forces of the South African apartheid regime and made way for the national independence of the people of South Africa. In several countries, Cuban doctors, agricultural specialists and teachers have helped on humanitarian missions. When Fidel Castro became seriously ill in July 2006, he relinquished his presidential duties to the vice president Raul Castro, his revolutionary comrade and brother.. As soon as he regained physical strength, he wrote letters and articles on global issues and continued to influence Cuban policy. At the final session of the 7th Congress of the Cuban Communist Party on April 19, 2016, he referred to his ripe age of 90 and declared, “This may be one of the last times that I speak in this room, but the ideas of the Cuban communists will remain as proof that on this planet, by working with fervor and dignity, we can produce the material and cultural wealth that humans need”.